Scrape out the blue/grey underfur for fine dubbing or use the guard hairs for tails. 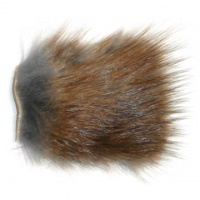 Muskrat has a natural water repellancey that aids floatation on dry flies. The grey underfur is used on the famous Adams dry fly.